Daniel specialises in recording and mixing acoustic music. 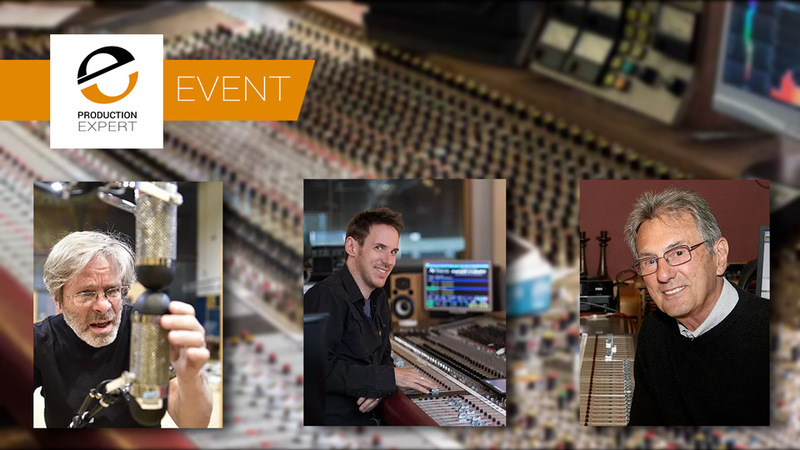 As a young engineer, he was inspired by the work of both Al Schmitt and George Massenburg and now has chosen to set up this event where he will be joined by his two main influencers to present this unique learning opportunity for engineers and students to experience and learn from a team of 3 experts in recording and mixing acoustic music. “It was interesting to me to analyse their recordings because they work and sound so different. 20 years later, I have developed my own approach to recording acoustic music by creating a very large depth of field while maintaining the physical integrity of the instruments. A comparison of today’s recordings from those of the 50’s and 60’s reveal that there hasn’t been much progress in this domain as the majority of today’s jazz recordings sound small. Obtaining a sound, which has the ability to transfer emotion to the listeners - that’s really what it’s all about”. Daniel wanted to make this event something really special, a mix between a large and somewhat impersonal conference and an intimate masterclass like Mix With The Masters. This format provides the best of both worlds, in that many people can both experience and learn first hand and see 3 different approaches to recording and mixing acoustic music rather than a handful of people being able to experience one person’s approach. Daniel will achieve this by having most of the event held in the main conference room and then use multi-camera video streaming from the recording and mixing venues so that attendees can see and hear exactly what is going on and experience 3 different approaches from George, Al, and Daniel. Recording a jazz band in old-school style as compared to today’s approach (musicians separated and the use poly-mic system). The benefits of vintage microphones. The truth on recording analog or digital and their necessity in today’s recording environment. The importance of recording with a clear idea and concept. The importance of analysing sound by ear to get quality in the production process. To develop a “vision” of the sound and how to achieve that vision. How to get “depth” in a recording and how to get it in the mix. How to successfully start a business in the recording industry. The conference language will be English. All other lectures and discussion sessions will take place in the conference room and lunch will be included on all 3 days. Most of the event will take place in the main conference room. On the first day, Daniel and Al will be tracking in the Jazzcampus in Basel, which is an academy, music school, jazz club, and a meeting place. The Jazzcampus houses a modern recording room, which includes a large Steinway D Concert Grand Piano. The Control Room is equipped with a state of the art Undertone Audio Console – the last that the company built. Daniel will provide all microphones from his unique collection for the whole team to use for their recording sessions. It includes mics such as the Neumann M50's, M49's, and many U47’s, U67’s and 77’s as well as KM56’s, 54’s, 84’s. Daniel’s collection also includes older Bottle Mics such as the CMV3 and 5, the BV30a, RCA's, Coles, Melodium Ribbon Mics, Brauner VM1, and an AKG C12. The sessions from the Jazzcampus will be relayed using multi-camera video streaming and PMC monitoring to the main conference room, so attendees will not miss anything, far from it, they will get excellent views of what the soundmasters are doing and hear it all through PMC monitoring. George Massenburg will track his session in the conference room, so all the attendees will be in the same room as George. On the 2nd day, Daniel and Al will be mixing at the Idee und Klang Studio, Basel built by Daniel Dettwiler in 2005. It features a Cadac G Series console that once belonged to "Scorpio Sound Studio". This console was used to record Queen’s "A Night At The Opera" – including Freddie Mercury’s Lead Vocals for the band’s classic "Bohemian Rhapsody" and Ken Scott mixed two Supertramp Records on that board. (Crisis? what Crisis?, and Crime of the Century). Idee und Klang has a top selection of outboard gear, such as the Fairman Tube Master EQ and the Undertone Audio UnFairchild compressor as well as some great reverb options, which include the Lexicon 480 and 960, a Quantec Yardstick, a Sony DRE 777, EMT 140 and a Bricasti M7. As with the tracking sessions, these will be relayed using multi-camera video streaming and PMC monitoring to the conference room, so attendees will not miss anything. Below are some images showing what attendees in the main conference room will be able to see via the multi-camera video streaming from Daniel’s ‘Idee und Klang’ Studio. Because George Massenburg tracked his session in the conference room, it is very likely that he will be mixing his session in the conference room as well so again all the attendees will be in the same room as George. On the recording and mixing days (May 3rd and 4th) the event will start at 9am and finish around 7pm. On the 3rd day (May 5th), they will start at 10am and finish around 6pm. To get things going, Al Schmitt, George Massenburg and Daniel Dettwiler will record a jazz band. The 3 experts will both explain and demonstrate a variety of different methods of mic set-ups before recording the group using their different set-ups. The team will present as much as possible in person in the main conference room explaining their steps in the recording process and their reasons for choosing one technique over another. They will demonstrate how it sounds if the musicians are separated during the recording and then compare it if the musicians play all together in the same room. During the mixing sessions, each engineer will discuss his own mix, in “real-time” as it is happening. Participants will be able to observe these engineers at work and will be able to ask questions about the mixing process as well as listen and compare the results. Between each session will be a discussion session in the conference room. On the final day, the team will analyse and discuss, the results of two full days of recording and mixing sessions in the main conference room. The 3 engineers will explain in detail their individual methods and techniques used during these sessions. In addition, there be further teaching sessions and a Q&A session. Al Schmitt has been recording music since the ‘50’s, first at Apex Recording Studios and then as an engineer at RCA. After having worked several years as an independent producer, he began spending more time as an engineer and is presently doing most of his work at studios such as Capitol and Powerstation (Avatar). Scanning Al Schmitt’s discography would take a long time, because Al’s decades of award-winning work read like a trip through musical history. From Frank Sinatra, Henry Mancini, Sam Cooke, Ray Charles, and Miles Davis; via Jefferson Airplane, Jackson Browne, Neil Young, Johnny Cash, Willie Nelson, Kenny Rogers and Steely Dan to Barbra Streisand, Natalie Cole, Madonna, and Quincy Jones mingling with Michael Jackson, Diana Krall, Celine Dion, Paul McCartney, and Michael Buble. The highlights represent a group of artists who, with Al Schmitt’s help, have shaped and defined the music of generations. There are few within the music industry who have overseen more culture-defining artistic moments than Al Schmitt. The winner of 20 Grammy awards, 2 Latin Grammys and a Trustees Grammy for Lifetime Achievement, Al has helped artists collect 160 gold and platinum albums. Recognising that talent, Al Schmitt was honoured with a star on the Hollywood Walk of Fame in 2015, with his star right in front of the iconic Capitol Records building where so many of his great hits were recorded and where he continues to record today. George Massenburg is a specialist in the domain of acoustic music. Massenburg participated (individually and collaboratively) in over four hundred record albums over the past 45 years. His work includes recordings of Earth, Wind & Fire, Billy Joel, Toto, Dixie Chicks, Journey, Randy Newman, Lyle Lovett, Aaron Neville, Linda Ronstadt, Herbie Hancock and many more. He has designed, built and managed several recording studios, notably ITI Studios in Hunt Valley, Maryland, Blue Seas Recording in Baltimore, and The Complex in Los Angeles. In addition, he has contributed to the acoustical and architectural design of many other studios, including Skywalker Sound and The Site in Marin County, California. In 1982, he founded George Massenburg Labs, a pioneering audio electronics company that has released an extensive range of innovative console automation devices, analog signal processors, microphone preamplifiers and power supplies, all based on his original circuit designs. Among GML’s most well known products is the GML8200 Parametric Equalizer and the GML8900 Dynamic Range Controller. George is also an Associate Professor of Sound Recording at the Schulich School of Music at McGill University in Montreal, Quebec, Canada and a Visiting Lecturer at the University of California, Los Angeles, the University of Southern California, the Berklee College Of Music in Boston, and the University of Memphis in Memphis, TN. He won the Academy of Country Music award for record of the year in 1988, the Mix Magazine TEC Awards for Producer and Engineer of the year in 1989, the TEC Awards Hall of Fame in 1990 and the Engineer of the year award in 1992. He won a Grammy in 1996, and the Special Merit/Technical Grammy Award in 1998. In 2005, Massenburg was inducted into the TECnology Hall of Fame for his 1969 invention of the ITI ME-230 Parametric Equalizer. In 2008 he received the AES Gold Medal. In 2009, he was awarded an honorary Doctorate of Music by Boston’s Berklee College of Music. Daniel Dettwiler represents the younger generation of sound engineers. He was born in 1974 and lives in Basel with his family. He studied Audio-Design at the "Academy of Music", Basel, from 1996 until 2001. As a recording engineer, he is specialized in the production of acoustic music, especially jazz and film music and early in his career, he was heavily influenced by the work of both Al Schmitt and George Massenburg. With his understanding of the importance of high-quality gear, Daniel began building a new place to record in Basel - the “Idee und Klang Studio”, which has become one of Switzerland and Germany's leading studios for acoustic music. It boasts the largest collection of vintage mics in Switzerland. As a recording engineer, he has specialised in the production of acoustic music, especially jazz and film music. Daniel’s work includes projects with the London Symphony Orchestra, ECM, Mark Turner, WDR Bigband, Lisette Spinnler, Ute Lemper, David Klein, WDR Bigband, Kolsimcha, Nils Wogram, Jasmin Tabatabai, Christian Zehnder, Mark Turner, and Jorge Rossy. His work is noted for its superb tonal quality and very large “depth of field”. In 2003, Daniel began giving lectures at Musikhochschule Basel (Applied Production Technique and Realisation) and in 2018, became a professor of Sound Engineering. He also teaches at the University of Arts in Zürich. In 2005, together with Ramon de Marco he founded “Idee und Klang Audiodesign GmbH” which specializes in Sound Installations and Acousmatic Spatial Orchestration. Many projects have followed, such as Audio Design and Spatial Orchestration for the new BMW Museum in Munich or "Magicbox", the State Grid Pavilion at the Expo 2010 and the composition of the acoustic layout for DRS3 and DRS2. Furthermore, Daniel Dettwiler has worked as an audio designer of concerts for composers such as Beat Gysin, Andrea Molino, Thomas Kessler and Heiner Goebbels. "Idee und Klang engineer Daniel Dettwiler does awesome recording and mixing - with such an incredible array of artists. This stuff sounds wonderful!! So big and open... he's an incredible, amazingly talented engineer." "I will say that Daniel has the best ears and mind that I have ever met... He is a true master, he has created reference quality recordings, and I consider his opinions beyond reproach." "It’s really spectacular. Daniel has done a fantastic job with the mix!" If you would like to learn more about Daniel then check out his personal website. You will need to request tickets directly from the Sheer Pleasure Of Sound website. To make sure that you get the exclusive Production Expert 25% discount please make sure in the section of the application form titled “What do you want to apply for” to state which type of ticket you require and most importantly to mention that you saw this on Production Expert. With this ticket, from the main conference room, you will hear and see the Soundmasters at work and take part in all the lectures, discussions and Q&A’s sessions. Lunch is included on each of the days. There were opportunities to join the engineers in the Control Room as they demonstrate their methods. However these upgrades are sold out. All available tickets are for the main conference room only, where you will be able to follow everything that isn’t in the conference room vis video streaming. There is a waiting list for opportunity to join Al and Daniel in the control room. But if you want to take this opportunity, you will need to pay full price. The discounted prices we are offering cannot be upgraded to being in the control room. If you cannot make the entire conference then there is the opportunity to be in the man conference room for either or both of the recording and mixing days. Lunch is included. Alternatively, you can just attend the final day of the conference, listen to the results, and enjoy the lectures, Q&A's and discussions. Lunch is included. For 100 Euros per day students can come to any or all of the days with lunch included. To be eligible for this student discount, you must be able to prove that you are a student in a recognised educational establishment. Examples of appropriate evidence include a photo of a valid student ID from your educational establishment, or an email from a member of staff sent from an educational establishment email address confirming that you are a current student at that establishment. Thanks to the generous support of an anonymous supporter there are a limited number of bursaries for students. Again you will need to provide proof that you are an active student and email the organisers, explaining why you should be considered for a bursary. If you can get to Basel in Switzerland for the weekend of May 3rd to 5th then do it. Even the full 3 day ticket is a very cost effective package to learn first hand from Al Schmitt, George Massenburg and Daniel Dettwiler. Yes, you are also going to have to get to Basel and arrange your own accomodation but compared to other similar events, what Daniel has put together is very reasonable and even better with the discounts we have been able to arrange with Daniel.